Our classic coffee pod Café au Lait, now in a decaffeinated version! So whether it’s late in the evening or you just fancy a decaffeinated coffee, Café au Lait Decaffeinated will delight you with its milky coffee aroma topped with silky foam, all in one clever capsule. Making these velvety pods couldn’t be easier. Because the rich coffee and the milk are mixed together in one pod, great tasting coffee is just moments away at the touch of a button. Also, thanks to the maximum 15-bar pump pressure in our beautifully designed coffee machines, you can expect the same quality that you’d get at a coffee shop. Topped with silky foam, our lovely Café au Lait Decaffeinated pod drinks don’t just taste great; they look the part too. Whole Milk Powder (71.9%), Decaffeinated Soluble Coffee (26%), Stabilisers (Dipotassium Phosphate and Trisodium Citrate), Emusifier (Soya Lecithin). 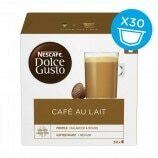 I love these decaffeinated drinks, they are very tasty and not too strong. It is a shame they don't come in a larger pack or that decaf isn't available in more varieties. Just love it. I simply have to have one every night! I like this in the evenings when I fancy a change from the hot chocolate! It tastes just like the standard cafe au late pods, I cannot tell the difference at all! Would love to see some more decaf versions..maybe in the lattes/cappuccinos/mochas?